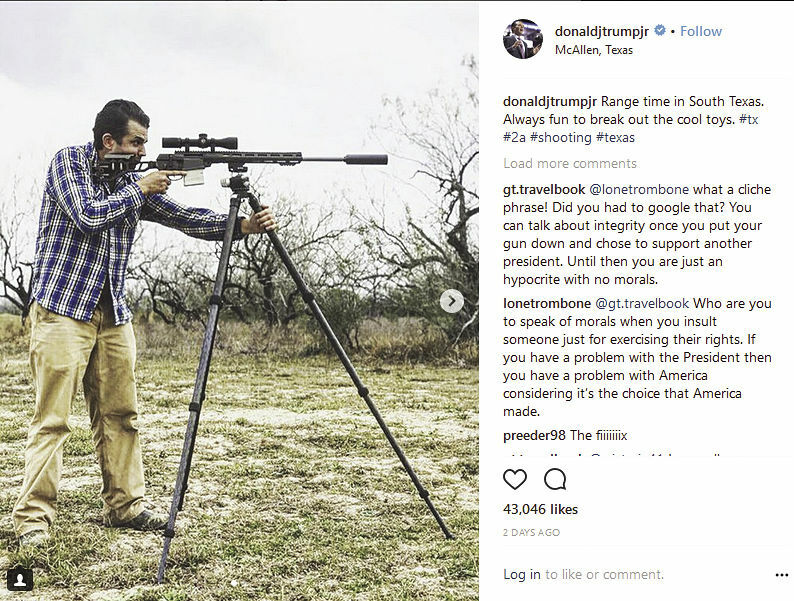 McALLEN — Donald Trump Jr. made a quiet visit to South Texas this past weekend. It’s unclear when the president’s son arrived, but he was seen departing the McAllen Miller International Airport at about 2:30 p.m. Sunday, according to reports from an eyewitness. Trump posted a picture Monday to his Instagram account that indicated he was in McAllen. The full-body image shows him aiming a high-powered weapon hoisted on a tripod. Trump reportedly shot nilgai while on his visit, but it’s unclear who accompanied him on the hunt. The visit came shortly after he made an appearance at the world’s largest gun show, the 2018 SHOT Show, where he was part of a Q&A. Held in Las Vegas, the event drew more than 65,000 attendees this year.